Our lives are made in these small hours, these little wonders, these twists and turns of fate. Time falls away, but these small hours… these small hours still remain. And in the end, we will only just remember how it feels. Yesterday, I was so carried away with the knowledge that it was my beloved mom’s birthday (March 23). We talked on the phone for roughly 30 minutes, and then I went to bed at quarter past midnight. I woke up to a new day, took a shower, ate my little brunch and just after I drank the very last drop of my apple grape juice, that’s when I realized that high school is already exactly 732.5 days ago. 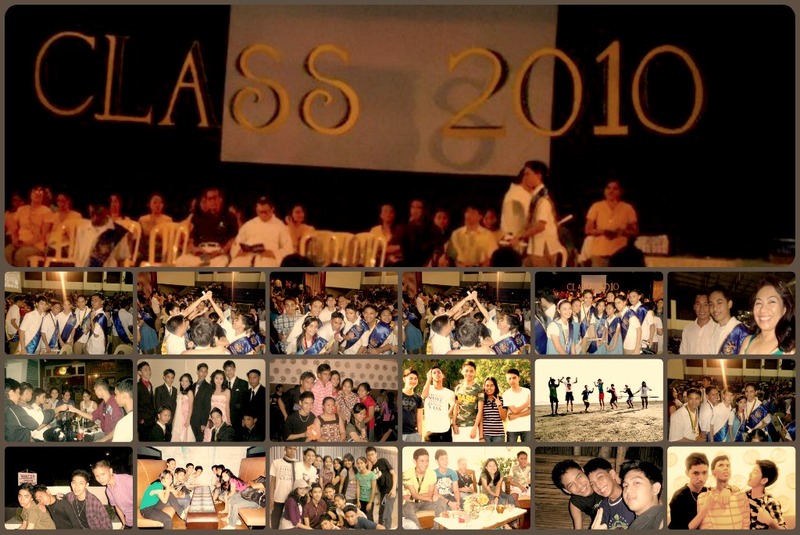 March 24, 2010 (High School Class 2010 Graduation). Two years ago, I never really thought that I would write about this one day. When I was in high school, all I ever wished for was to get out of high school. I couldn’t wait to put those four years, which I considered a heavenly hell-like ghetto paradise, behind me. But now that I am in a new country where no one really knows me at all, I begin to find out how much I love my high school days. It’s almost like the only certain thing that had happened in the past. High school is still fresh to my memory. All still appears clear to me: the hallways, the classrooms, the textbooks I used to carry with me to school, the names and faces of teachers, the canteen, the university football field (which happens to be my favorite place in the world), the subjects I really really hated (which I’m sure I’ll never get to encounter ever again in my life), the high school park (even if I never really spent a significant amount of my time there), the lobby, the tall, shady trees which made breathing through those four years a lot easier, the gymnasium, the amphitheatre, the lockers, the armchairs and the energy of each student in the department. But apart from that, what resounds to me the most is the fact that everytime I think about high school, I instantly get this weird, giddy notion that all of it feels like just yesterday. And it does. It does feel like 24 hours ago. I can never really completely explain how much I feel right now. I’ve never really felt anything like this before. It’s that feeling that you’ve lived so much in the span of two years, but then you look back to the years before that and you notice that you’ve never lived like you’ve lived high school. Yes, high school was full of drama and superficiality. And I often doubted its purpose. I even reached the extent of cursing it. But I take all that back now. I was a kid, and I may have said and done things which didn’t really make sense then, but actually ended up defining who I am now. So yes, high school was a lot of work, but it was also definitely an array of subtle yet vigorous life-defining moments that taught us lessons which are everlasting. And I don’t know if the rest of my batch mates feel this way, but I do. I do feel that those cliques, those social codes, those rainy days of cramming, those stern classes, cheesy puppy and first loves (which we all thought would last “forever”), those cute little notes we made, those little fights (which then seemed like World War 3), those academic and social competitions, those dry and dire hours of bearing with Drafting, Math, Physics and CAT, those flag ceremonies (which I usually skipped), those numerous mass services in the oratory (which I also skipped), those moments of staying in the campus past hours, the tiny bits of “suffering” and the overall tragicomedy were ALL worth it. This entry was posted in Stories and Experiences, Thoughts and tagged Graduation, High School, Kenn Edward Tenorio, University of Negros Occidental- Recoletos. Bookmark the permalink.